Stone fruit is one of the highlights of summer I look forward to every year. I can't wait for peaches, nectarines, apricots and cherries to show up in the markets. 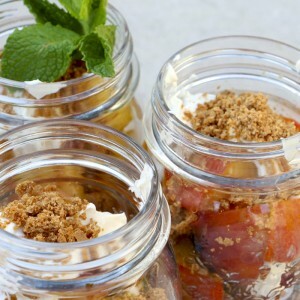 I use stone fruit in savory dishes as well as to make panna cotta, crisps and crumbles. For a crisp, I generally like to use full-flavored peaches or nectarines and not white peaches or white nectarines, because for baking I like the tartness of the regular peaches and nectarines. 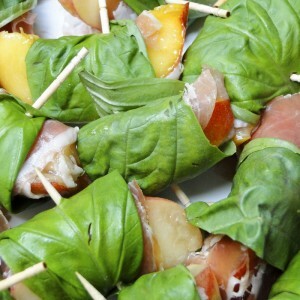 For this recipe, however, I use white nectarines. It was one of those cooking accidents that surprised me. I was trying to buy regular nectarines, but the only ripe ones at the store were white nectarines. Nothing like a little serendipity; I really like how the sweet white nectarines meld with the salted honey whip cream. Which brings me to another point; don't skip the whip! It really makes this dessert. If you use a food processor, you can throw together a crisp in 15 or 20 minutes. I like to make extra topping and stash it in the freezer for a future crisp. Not feeding a crowd? You can make the topping for this crisp and divide it in half. Use half the topping to make an 8" crisp and save the remainder in the freezer for a second dessert. At our house we make the full size crisp. If we are lucky enough to have leftovers we eat it for breakfast the next day. A sprinkling of flakey salt does great things for many desserts, including this one. Salt is a great counterpoint to sweet and mellows bitterness in citrus. A little salt on a dessert adds complexity and causes you to sit back and really take in what you are tasting. Flakey sea salt, like Maldon, also adds a pleasing crunch. Heat oven to 400 degrees. In a food processor pulse together the first 6 ingredients. Add butter slices and pulse until mixture is crumbly. Add oatmeal and walnuts and pulse a couple times to incorporate. You don't want to over mix as it will reduce the texture. Put the chopped fruit, 1/4 cup sugar and 4 T flour in a large bowl and use your hands to gently mix. Put the fruit mixture in a 13 x 9 x 2" baking pan or a 12" round baking pan. I use a 12" Spanish cazuela. Spread the flour, sugar, butter, nut and oatmeal mixture over the fruit. Bake for 30 minutes, until the top of the crisp starts to brown. While the crisp is baking, prepare the whipped cream. Put cream, lemon zest and honey in a bowl and whip on medium to medium high until the the whip cream forms peaks. 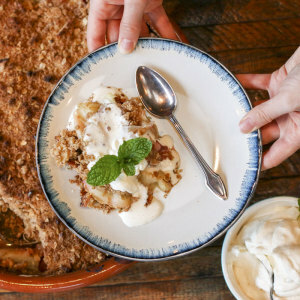 Serve the crumble with a big spoonful of whipped cream and a light sprinkling of Maldon salt.